Our football and multi-sports clubs provide opportunities for your child to develop both physically and socially, in a safe and familiar environment. Sessions include fun warm up games, technical drills, skills sessions, and mini games and matches. Each week one child is awarded the Star Player Award in recognition of their participation, sportsmanship and behaviour. *Teen Camp standard times are 10am to 3pm and costs £15 per child per day. Should you need to drop your child off earlier, and/or collect them later, a single additional fee of £5 per day applies (regardless of the extra hours you need), and can be booked on the system. *Art Academy offers a morning session (9am to 12pm), and afternoon session (12.30pm to 3.30pm); children can also book the full day, please provide a packed lunch and drink. Please Note: Our new booking system sometimes has difficulty communicating with Hotmail accounts; if you register using your Hotmail email address please look in your spam/junk folder for your confirmation email. Please add StepUp to your safe senders list! 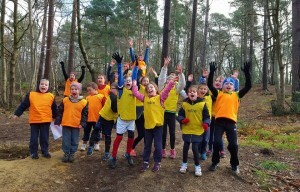 Our sports camps are located at Edgbarrow Sports Centre, Grant Road, Crowthorne, RG45 7JL. Parents/carers should drive into the site and park where you see a space. When you drop off your children you will need to sign the register. Drop off times are 8am or 9am, depending on which session you have booked. Please do not drop off your children earlier than these times as staff will be unavailable due to preparing the site for the day’s activities. If you arrive too early you will be required to stay with your child until the team is ready. If you arrive late, please call 07766-747932, and a member of the team will either let you in or direct you to where we are. Parents/carers are required to collect their children from the small hall located to the left of the sports centre’s reception area at either 4pm or 6pm, depending on the session you have booked. Trainers / Jogging bottoms or shorts and T-shirt/jumper +spare clothing should your child become wet or muddy. FOOTBALL CAMP: We insist that children wear shin pads when we play football, so please ensure your child has a pair. Football camp takes place on astro pitches, astro boots/trainers are OK to wear, but no studded boots are allowed. Football Camp is all-weather, so please ensure your child has a waterproof coat; if the weather is particularly bad we will relocate indoors. Bring a Packed lunch and 2 snacks for mid-morning/afternoon breaks, and a non-fizzy drink in their own drinks bottle. We supply water refills as required throughout the day. Please call 07766-747932 and leave a message should you need to speak with a member of the StepUp team. Messages will be checked and responded to during breaks/lunch. If you need to speak to us urgently, please send a text message requesting an urgent call back.